If you're thinking of heading off to Sunny Beach, Bulgaria for the first time this summer or perhaps you've been before and are looking to try a new hotel? We've taken our expert knowledge and over 48 years of experience in providing quality holidays to the resort of Sunny Beach to put together our list of six Sunny Beach hotels we think you may want to try out and will prove popular in 2014. Based on previous summer seasons and customer feedback, we have compiled the hotlist with all our customers in mind so no matter what your budget or taste is, we are sure you can find a hotel in our hotlist perfect for your summer holiday needs. The Hotel Fenix takes up an excellent position in the resort with an enviable location just a short distance away from the golden, sandy beach and the resort’s lively promenade. There are plenty of shops, restaurants and bars nearby too. Snuggly tucked between the hotel and its well-kept green lawns is the hotel swimming pool which offers a children’s section at one end and an inviting pool bar serving a selection of refreshments at the other. In addition to its range of facilities, this contemporary hotel is also home to the friendly and welcoming Mr Bear’s Kid’s Club providing exciting and action-packed activities to keep the little ones occupied while making new friends. The Hotel Fenix provides modern and comfortable studios, twin and family rooms, all with equipped with air-conditioning. Package Holidays to the Hotel Fenix start from just £332pp. 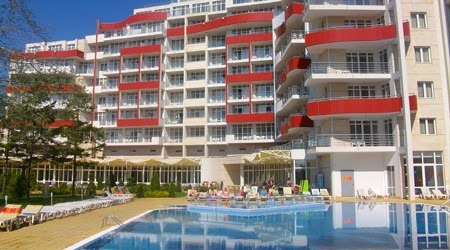 The excellent Hotel Globus is an established landmark in Sunny Beach. Location wise it does not get any better than the Hotel Globus which is literally just steps away from the golden sand of Sunny Beach. The hotel is also right in the very centre of the resort, splitting it in two equal parts to the north and to the south. At the Hotel Globus, everything is on your door step, the pleasant seaside promenade, the 8 km long stretch of sandy beach, restaurants, bars, cafes and shops galore. The Hotel Globus offers the perfect combination of elegance and comfort combined with a wealth of facilities including an outdoor swimming pool with a children's section and an impressive indoor swimming pool with an attractive summer terrace. The À la carte restaurant with outdoor seating area around the pool is perfect for a romantic evening meal before heading into the hotel's Bowling alley for a few strikes of fun. All of the rooms are impeccably furnished with some offering unrivalled sea views from the upper floors making this hotel the perfect choice for a great summer holiday. The Hotel Globus has also recently been renovated ready for summer 2014. Package Holidays to the Hotel Globus start from just £383pp. 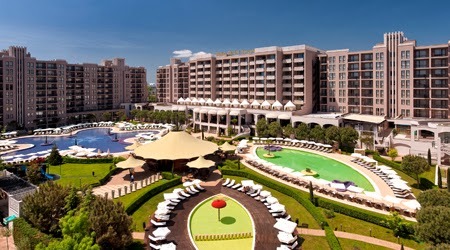 The modern and luxurious Hotel Iberostar Sunny Beach is a firm favourite with Balkan Holidays clients. Comprising of two identical buildings each mirroring the other, and offering the same high standard of accommodation and first class facilities. The Hotel Iberostar Sunny Beach is conveniently located just a few steps away from the sandy beach and is in close proximity to the resort centre and all its amenities. The Hotel Iberostar Sunny Beach provides excellent leisure facilities, a good mix of activities and entertainment, as well as professional and friendly staff. The hotel is great for children with its four children's outdoor swimming pools, a children's water slide, play area and mini club. In addition to the excellent All Inclusive board, the Hotel Iberostar Sunny Beach also offers an Ultra All Inclusive package (at a supplement) which include additional and exclusive facilities and services for an even more memorable summer holiday. 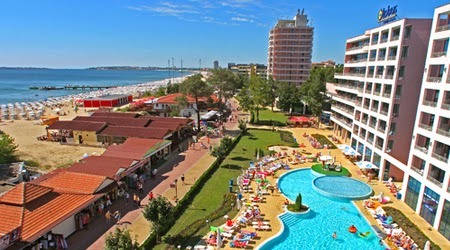 Package Holidays to the Hotel Iberostar Sunny Beach start from just £420pp. Perfectly located in the heart of Sunny Beach, the luxurious Hotel Barcelo Royal Beach provides the highest quality of accommodation, facilities and services you will find in Sunny Beach. The wide sandy beach is just a couple of minutes away from the hotel and all the resort highlights and points of interest are within easy reach. The Hotel Barcelo Royal Beach offers modern and spacious accommodation, a magnificent pool complex with outdoor and indoor pools, one of the largest gardens in the resort, a variety of quality food restaurants, professional Spa centre, Kids' club and children's play area as well as the largest shopping mall in Sunny Beach located within its very own grounds. Package Holidays to the Hotel Barcelo Royal Beach start from just £373pp. The All Inclusive Hotel Laguna Park benefits from a quiet location within the resort, just 5 minutes walk from the centre and the main promenade with the lovely sandy beach approximately 250 metres away. There is also a great variety of shopping and entertainment facilities nearby. Comprising of three interconnecting parts, the Hotel Laguna Park provides bright and elegant accommodation with the choice of twin and open plan family rooms, finished off with friendly staff and a relaxing atmosphere. There is a large outdoor swimming pool area with sunbeds and parasols for a lazy day in the sun and poolside bars serving ice cold refreshements. The little ones will be spoilt for choice at the Hotel Laguna Park which boasts an impressive outdoor children's pool with water slide, play area, mini club and entertainment centre with a bouncy castle. Taking care of the enjoyment of your children is the main aim of the Hotel's professional team of entertainers who provide a daily animation programme for the ultimate family summer holiday. 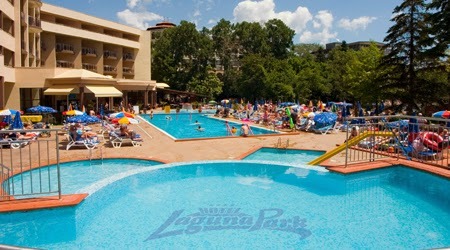 Package Holidays to the Hotel Laguna Park start from just £430pp. 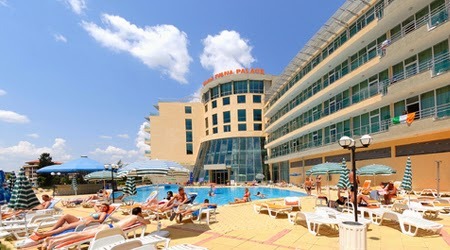 The modern and spacious Hotel Ivana Palace offers everything you would expect from a good holiday property. It provides spacious and comfortable rooms combined with a good selection of leisure facilities including an attractive outdoor swimming pool split in two parts by a small bridge leading to the pool bar, fitness, massage, souvenir shop as well as a large restaurant, all at hand for your enjoyment. 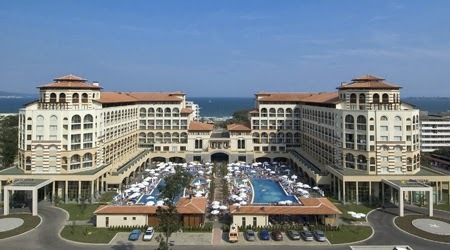 Package Holidays to the Hotel Ivana Palace start from just £338pp. To find out more about these or any of our other fantastic Sunny Beach hotels visit our holidays to Sunny Beach website today!